A new Grade 3 attacker for Link Joker and a new Overlord First Vanguard. AUTO (RC): [Counter Blast 1] When this Unit attacks a Vanguard, you can pay the cost. If you pay it, choose 1 Locked card, that card does not Unlock during your opponent’s next End Phase. AUTO (VC/RC) Generation Break 1: When this Unit attacks a Vanguard, during that battle, this Unit gains Power+4000. AC (RC): [Counter Blast 1 & Place this card into the Soul & Choose 1 “Overlord” card from your hand, reveal it] Look at the top 7 cards of your Deck, reveal 1 “Overlord” card among them, add it to your hand, shuffle your Deck. If you din’t add it to your hand, Soul Charge 1. “Bisector Between the Stars”, when its attack hits a Vanguard, it Skill lets you Omega Lock 1 Locked Card. And if you’ve achieved Generation Break 1, when it attacks a Vanguard, it gains Power+4000, making it more likely its attack will Hit. It can serve as a 14000 base Power attacker, so if you Call a 7000 Power Unit to the Back Row, it’ll be able to pressure your opponent with a 21000 Power attack. 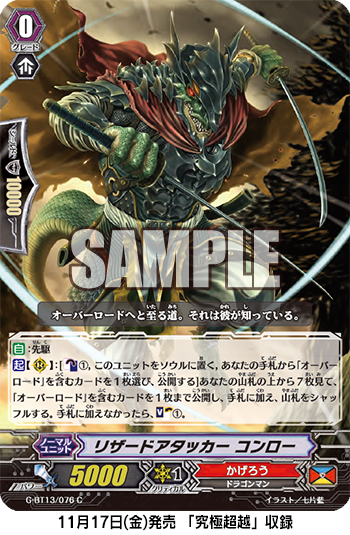 And, “Lizard Attacker, Conroe” is a First Vanguard for “Overlord” only, who you can place into the Soul, and then reveal 1 “Overlord” card from your hand, to let you look at the top 7 cards of your Deck, and add 1 “Overlord” card among them to your hand. But, if you don’t add any, you can Soul Charge 1 card instead. Unlike “Lizard Soldier, Conroe”, if you need Soul, you should choose “Lizard Attacker, Conroe”! The 13th Booster Pack “Ultimate Stride” greatly enhances and supercharges “Overlord” Decks. Look forward to future information! We’ll be introducing more cards from “Rondeau of Chaos & Salvation” and the 13th Booster Pack “Ultimate Stride”! Please look forward to it!